Got one of these for competition shooting with the .22LR . 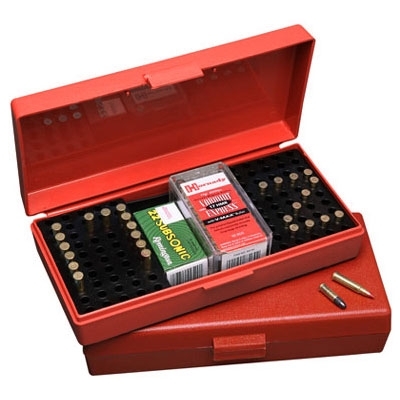 I can put my 40 competition and 10 sighter rounds down one side and upto 50 rounds down other side PLUS 3 boxes of 50 .22LR in the middle (turn boxes on their side!!) . few things I would like to have seen changed would be a lid stay on either side to hold the lid open or a roll pin hinge to allow lid to open fully in half plus a sponge/foam insert inside the lid to stop the ammunition in the two trays from rattling whilst moving around (although they won't fall out so don't worry about THAT) and maybe a small padlock point. A very handy little box oh yes.